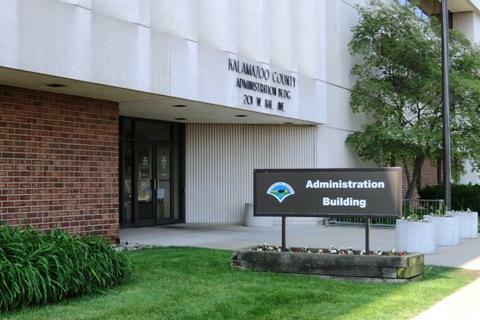 Kalamazoo County Commissioners seek answers from the Treasurer’s office. Governor Whitmer and Republican lawmakers battle over a department restructuring. A comeback by WMU women’s basketball comes up short. The K-Wings win their fourth straight. (Kalamazoo Gazette) Kalamazoo County Commissioners are seeking answers from the county Treasurer. The Kalamazoo Gazette reports that commissioners voted 10-1 Tuesday night for a motion that delegates County Administrator Traci Moored to seek answers about the treasurer’s responsibilities in regard to foreclosed property. The resolution calls for Treasurer Mary Balkema to submit a written report within 45 days. The Michigan State Police is investigating accounting practices in the treasurer’s office. Commissioners invoked a state law that says a county officer can be removed by a two-thirds vote if they fail to give a report at a board’s request. Balkema called the motion “political” and says she’s always been willing to share documents with the board and answer their questions. (MPRN) Governor Gretchen Whitmer is urging the state Legislature not to block a recent executive order to restructure the Department of Environmental Quality. Republican lawmakers don’t like that the order gets rid of some recently created environmental oversight panels. The state House passed a measure yesterday to undo the order. Whitmer’s Legislative Affairs Director, Greg Bird, sent a letter to the Legislature. It says the order makes state government – quote – “more efficient, responsive and effective by reducing bureaucracy.” Whitmer has also asked the state Attorney General to review the legality of two of the panels. (Kalamazoo Gazette) Kalamazoo County wants to settle a federal lawsuit involving its sheriff and one of his political opponents. The Kalamazoo Gazette says the county has proposed a $70,000 payment to Deputy Thomas Swafford. He sued the county in 2017 after challenging Sheriff Rick Fuller in the Democratic primary election the year before. Swafford says Fuller retaliated by removing his police powers. Swafford returned as a sworn deputy last December. The county's attorney says the settlement will be final after it's signed by both sides and filed in U.S. District Court. The City of Battle Creek is having second thoughts about some budget cuts. The city is looking for ways to offset a $2.4-million shortfall in state funding. But this week, city commissioners reversed some earlier spending reductions. They restored money for bus service, and for the police and fire departments. Battle Creek will use $409,000 from its reserve fund to cover the changes. City officials say they'll continue looking for ways to make Battle Creek Transit service more sustainable. (WCMU) A new report says new work requirements for Healthy Michigan could mean more than a quarter of all enrollees may lose coverage. The report comes a Los Angeles-based law firm and advocacy group founded by Charles Manatt, a former chair of the Democratic National Committee. It found that while state estimates projected a 4% to 8% loss of coverage, the actual numbers could be much higher, close to 27%. (Interlochen Public Radio) Researchers could generate renewable energy in abandoned mines across the Upper Peninsula. That’s according to a study from Michigan Technological University. They will run water down mine shafts spinning hydroelectric turbines. Michigan Tech will start testing the program in Negaunee this summer. (WCMU) One of the wolves brought to Isle Royale as part of a relocation effort has left by way of an ice bridge. Park officials say trackers on the wolves confirmed one female wolf left the island. She was one of three surviving wolves brought to the island as part of the relocation effort. She walked over an ice bridge into Canada. In women’s basketball, Western Michigan lost at Kent State Wednesday night, 55-51. Junior Kamrin Reed led the Broncos with 20 points. Western will play at Akron on Saturday. In hockey, Kalamazoo has won four straight after an 8-4 win over Indy Wednesday night. The K-Wings scored four unanswered goals after the Fuel tied the game early in the third period. The same two teams will play again tomorrow night at Indy.